Every time I say something about the garden, it conspires to prove me wrong. 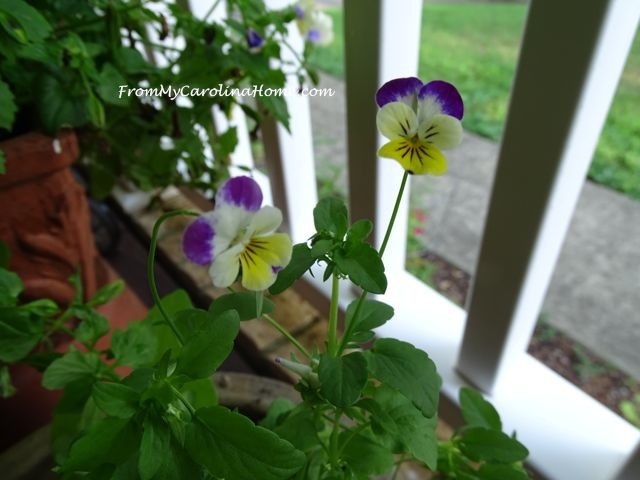 In July, I said that I planted the johnny jump ups too late to get any flowers. Then not a week later, here they come. I really cannot complain as I love their sweet flower faces. 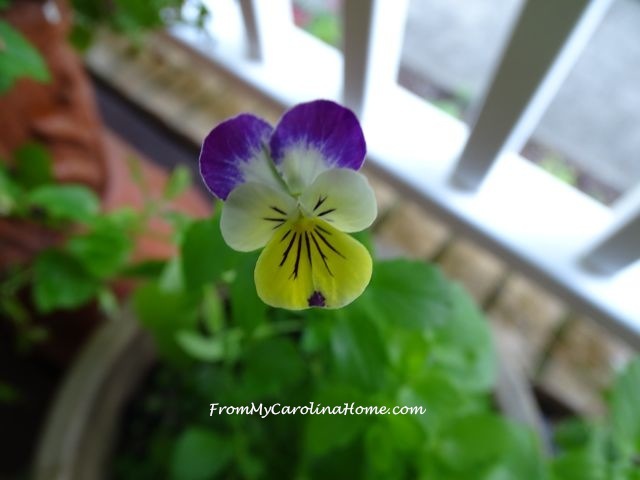 More little tiny buds are showing and I hope to have a lot of these soon. 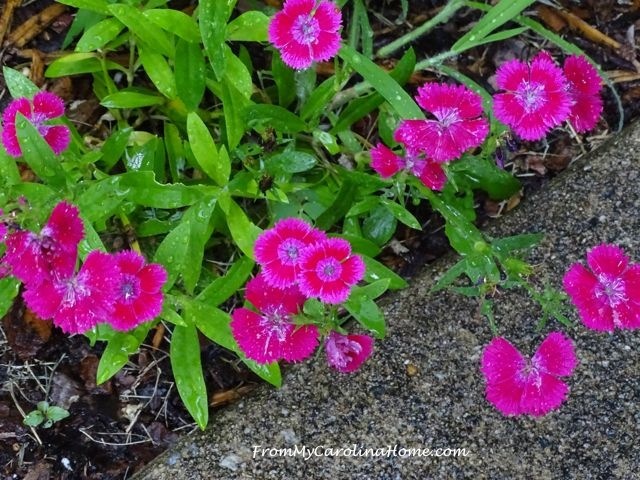 Then I said I was disappointed in the dianthus in the flower bed, and then they went to town blooming. 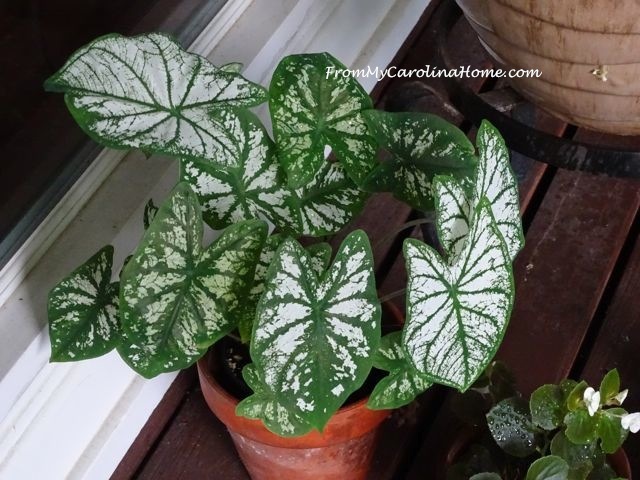 The caladium is getting a lot bigger. I’ll have to repot it soon. 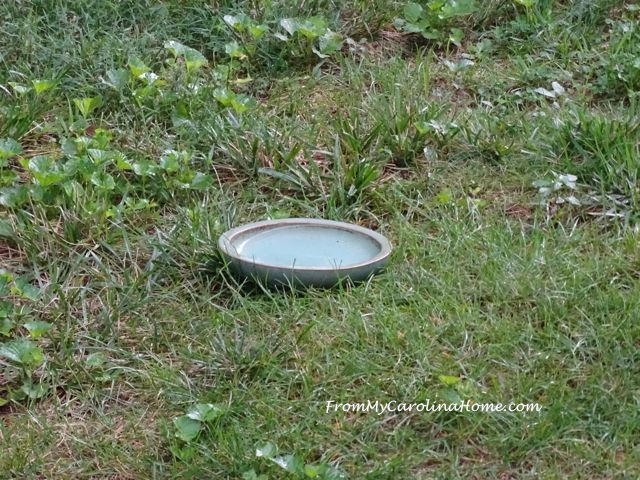 I put a saucer from one of my larger pots out in the yard near the bird feeder for the birds to use. Contrary little things haven’t touched it. 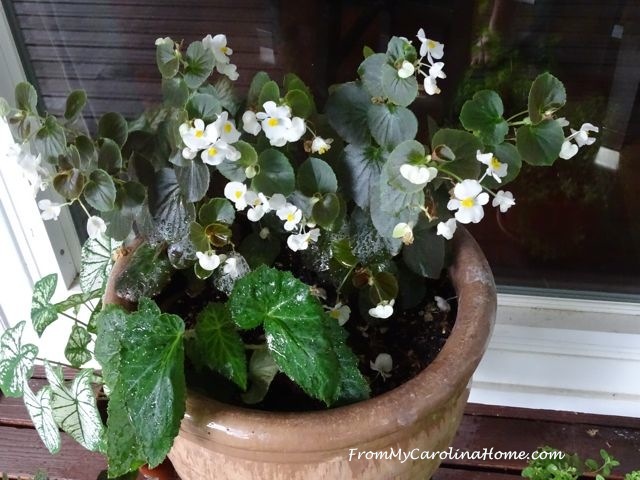 These white begonias must love this heat, every one of the pots that has them is blooming profusely. The verbena is still producing pretty purple flowers, surrounded by those begonias. 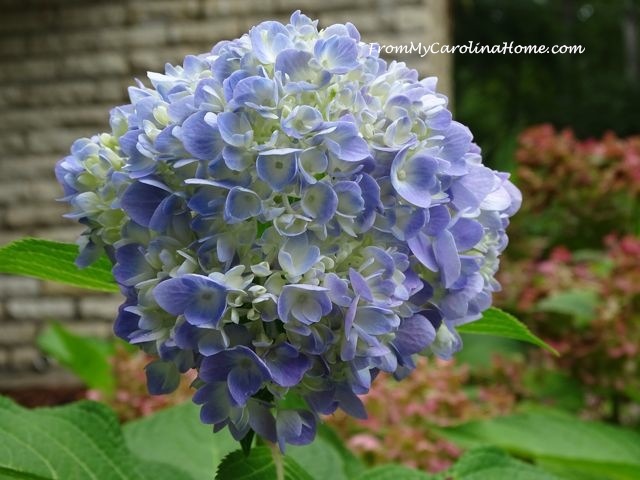 and one in a blueish hue with some purple and white, all on the same plant. At the same time! I think this one will deepen to all lavendar over the next week or so. Of course, the torenias are still going strong. 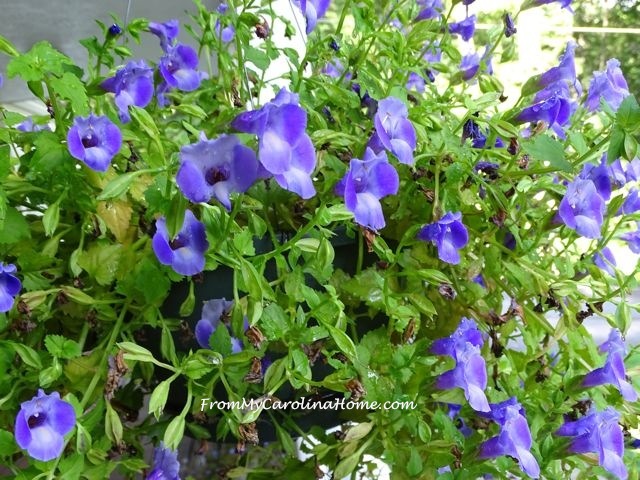 These baskets will keep going all summer and well into fall. Then there were the visitors this month. 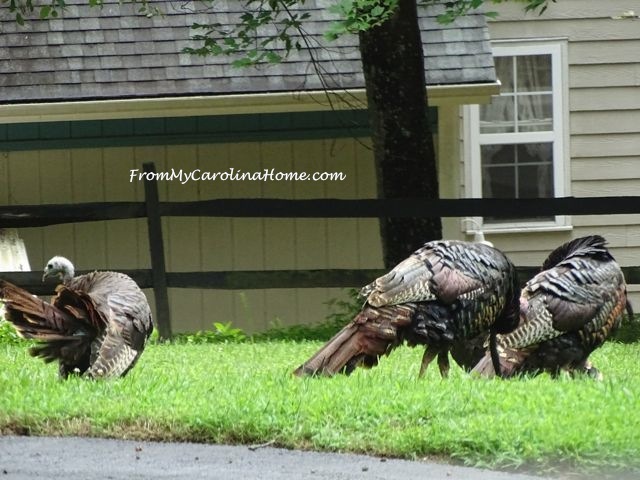 A small flock of wild turkeys is back, which usually doesn’t occur until September. I am hoping for cooler weather soon. With the longer lens on my camera, I can get much better pictures of the wildlife now. These males were fluffing their feather against the rain, and I was hoping they would spread them and strut but they didn’t oblige me. The one on the right here is a juvenile, likely hatched this spring. I think this small flock of five is all bachelors. Hard to say though, as the young ones don’t have their red coloring on their heads or the feather wattles they will get later. But the females don’t turn red or grow wattles. Either way, I just like watching the wildlife as it strolls by. They stayed around for quite a while, eventually working their way around the house and up the mountainside behind the house. 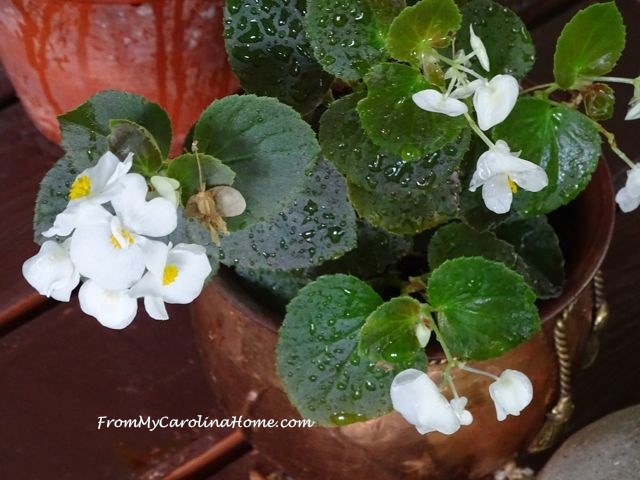 What is going on in your garden? Maybe with cooler weather. .if that is what you have had, the flowers have put on a glorious show. 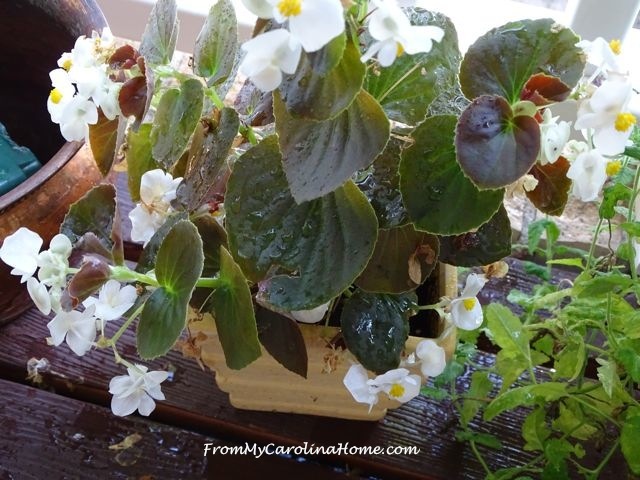 Lovely begonia with water droplets.The other day I had a trip to hospital, and the lovely doctor in the Emergency Dept., was from South Carolina, Charleston, and before that from Richmond, S.C. When I mentioned that I had blog friends in both North and South C., he said ” Well, you have us all covered”. Ha ha! Mother Nature does have a perverse sense of humor, doesn’t she???!! 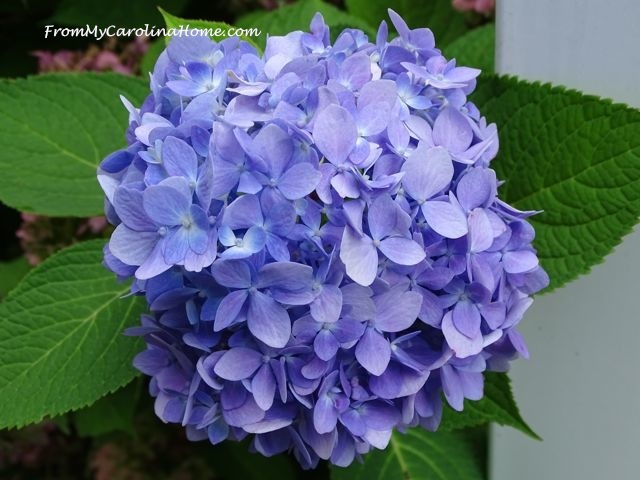 The flowers are absolutely beautiful, aren’t hydrangeas wonderful? My desert garden consists of a pair of tomato plants that I am struggling to keep alive and a lovely barrel cactus. Everything else burned up in the triple digit heat and single digit humidity. But your beautiful pictures inspire me to do a winter garden. Enjoyed these pictures!!!! Very pretty! Oh that Johnny Jump up is my favorite flower. 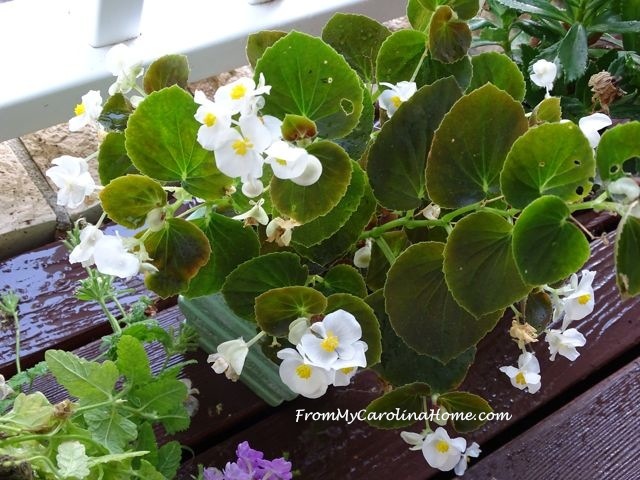 My Grandma had those in her flower bed, this brings back fond memories! Thank you for sharing! I love your garden photos. My outdoor garden consists of two flax plants and two Christmas cactuses on the balcony, plus an orchid in the house. The crape myrtles on the grounds in front of my corner are in full bloom and I have been enjoying the almost constantly blooming roses at my daughter’s home recently. 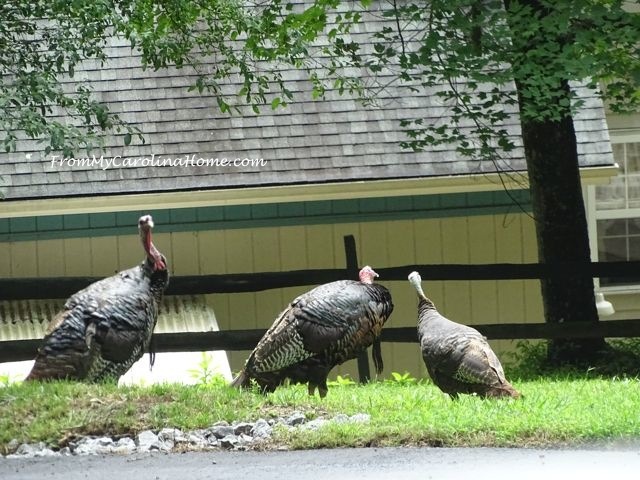 I do see flocks of wild turkeys on my trail walks near my apartment on a regular basis. 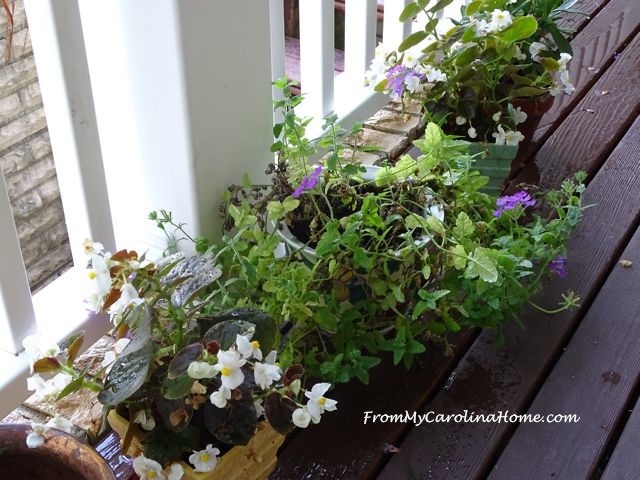 Your flowers are still lovely… many of mine have started to look spent and on their last leg. I need to get some maintenance done out there but it has either bee entirely to hot or too wet. Hopefully one day this week as the temps are down but it’s raining today. What a panoply of color! I love it all. I have a couple of those flowers, but mine aren’t doing well this year. It was just too hot for most of them. 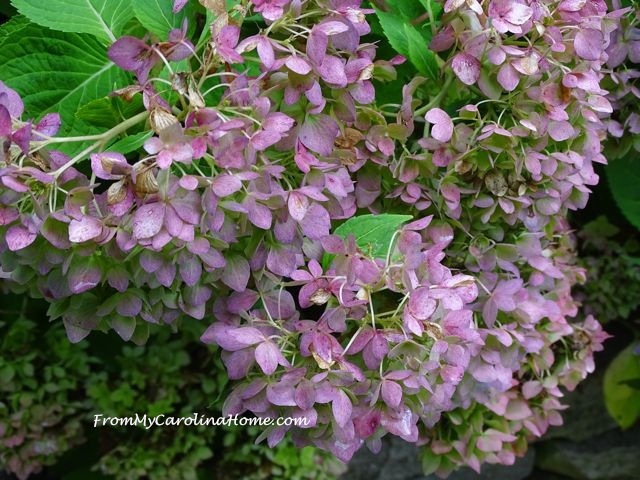 The hydrangea hardly even grew after the ants or something nipped all the buds. The dianthus goes in cycles for me – full coverage followed by nothing until one day I notice it’s all blooming again! 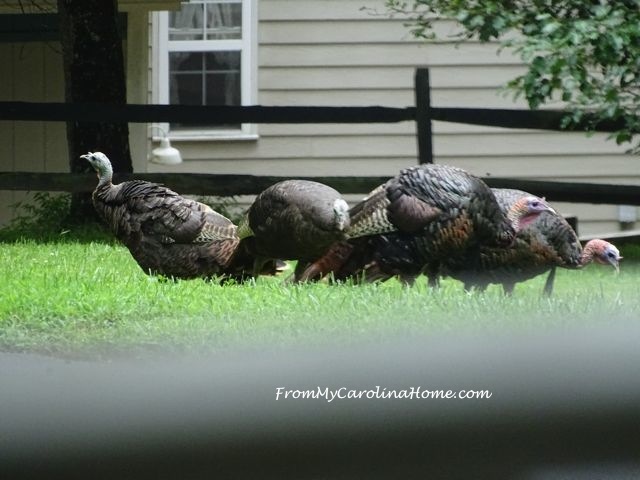 Enjoyed the beautiful flowers and the return of the turkeys. What beautiful pictures, thank you so much for brightening my morning! Thank you also for joining us at Celebrate Your Story.